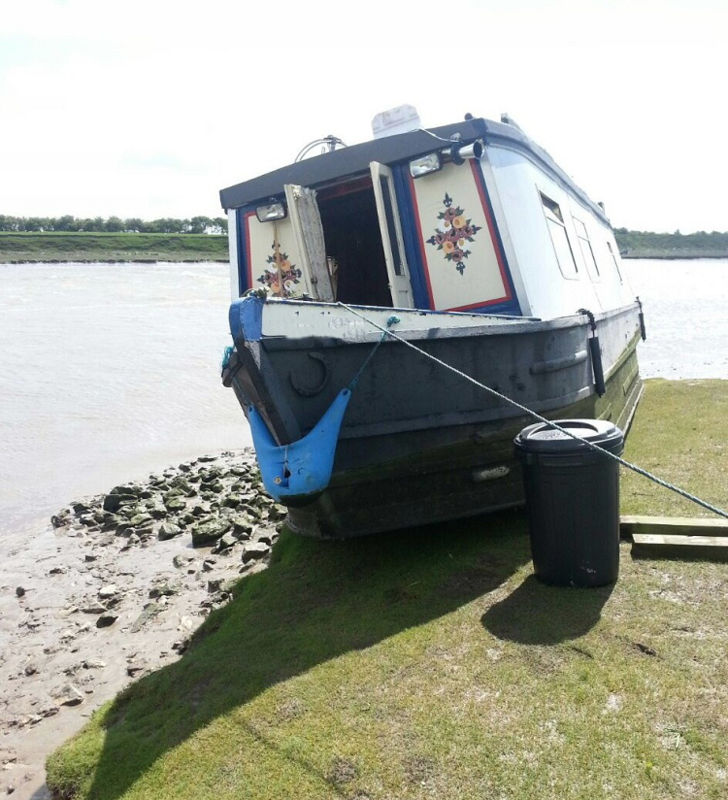 Yesterday afternoon (Monday 18th May) a 10 metre (32 foot) canal narrow boat ran aground in the Ribble Estuary while on passage from Preston Dock to the Millennium Link canal while making her way to Garstang. The receding tide left her high and dry on the river bank upstream from Freckleton as she failed to reach the Savick Brook entrance to the canal’s sea-lock. Lytham Coastguard unit quickly went to the scene and checked the three occupants were safe and well but there was cause for concern as the evening high spring tide flooded in and the wind increased leaving no margin for error when the vessel eventually refloated. The Coastguard wisely requested a Lifeboat to stand by in case problems arose which could place the casualty’s crew in danger. Low tide on Monday afternoon 18th May 2015 and the grounded canal narrow boat lies safely while awaiting the return of the water (Photo by Paul Little, Lytham Coastguard). The Volunteer crew of the Lytham St Annes RNLI Inshore Lifeboat Sally responded to the Coastguard’s request and launched at Seafield Road at 9.55 pm so as to time their arrival on scene as the tide began to make around the grounded narrow boat. With the Lytham Coastguard unit standing by on shore, the lifeboat kept close watch from seaward as the vessel eventually refloated safely despite the darkness and the rapidly flooding tide making conditions difficult. Once it was found that the vessel was undamaged she made her way up Savick Brook to the sea-lock and the lifeboat was released to return to station. The inshore lifeboat’s three man crew had to take great care returning to Lytham in the blustery south west wind and increasingly heavy seas but made it back to land safely at Seafield Road slipway at 12.43 am (19th). The ILB returned to her boathouse to be washed off and made ready for service again by 1.10am after nearly three hours at sea.